Weald of Kent Grammar School is located on the edge of Tonbridge just by the A21, only 10 minutes drive from the M25, 40 minutes from Gatwick Airport and 15 minutes' walk from Tonbridge Railway Station which has a frequent direct service to central London. Easily accessible yet set in spacious grounds with beautiful far reaching views of the leafy Kent countryside, the school has excellent facilities, many of which are available for hire during evenings and weekends. The Vauxhall Inn is just a few minutes’ walk from the school and offers excellent menus as well as accommodation. All hirers are required to provide evidence of suitable public liability insurance (minimum £5 million) and must ensure that coaches, teachers, instructors etc. all hold relevant qualifications (including first aid) and hold a current DBS check when working with children and or vulnerable adults. As a non-profit organisation, any profits from using the facilities at Weald will be re-invested into the education of our students. To enquire about hiring our facilities please contact James Stillgrove-Smith. 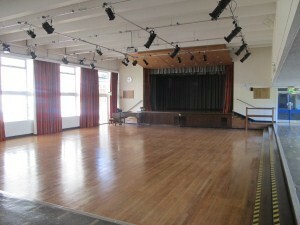 At approximately 18m x 16m, the main school hall is a superb venue for drama and music productions and rehearsals as well as presentations, conferences and meetings. The hall seats up to 400 with seating on two levels and features wooden sprung flooring, a stage with curtains, lighting rig, sound/PA system, projector and screen available for presentations. A large backstage area is available with additional changing room facilities. Entrance is via one of two reception lobbies, one of which has a "box office" and the other is wheelchair accessible. A small kitchen with serving hatch is to the rear of the hall, ideal for serving refreshments (no cooking facilities). A canopy extends over an area outside the hall, suitable for use during intervals or pre-performance receptions. Car parking for up to 60 cars is available on site with additional car parking available on Pembury Road. Hire fees are £45 per hour and reductions can be offered for longer periods. Please contact the school to discuss details. Our new Training Suite was built in 2014 and comprises three separate rooms that can be opened up to make a double or triple space accommodating over 100 people using flexible table and seating arrangements. With PC and interactive whiteboard, it is ideal for meetings, conferences and training courses. Catering ranging from tea, coffee and biscuits to superb hot buffet lunches can be provided by our caterers, Accent Catering. Hire fees are £175 per half day or £95 for up to 2 hours. Four full sized netball courts with floodlights. Toilets and car parking available. Hourly charge from £55 per hour May to July; £60 per hour September to April. Modern classrooms (7.5m by 8.5m) seating up to 30 at tables with electronic interactive whiteboards which can deliver DVD and internet content, either via desktop PC or laptop. Up to five classrooms are available on each of three floors in a new building with full disabled access. 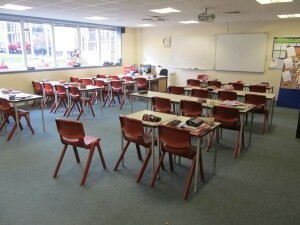 Two classrooms can be joined by removing a partition to create a larger space. Pricing from £30 per hour per classroom. Reductions can be offered for longer hires and regular hires. The Drama Studio has a sprung floor, blackout curtains, lighting and changing rooms. Pricing from £30 per hour with reductions available for regular hires. This fabulous new space is ideal for informal meetings. Pricing from £30 per hour with reductions available for regular hires.